No one company can single-handedly fix mobility – the market is simply too large, with too many players and too many variables. Some, like Uber, want to control the supply side by working to build such an expansive offer of ride hailing services, bike shares, car shares and other mobility on demand solutions that it covers the market by itself. Others, like MaaS Global with its Whim app, want to control the demand side, by giving its customers access to selected partners and handling everything from the planning to the payment. Liad Itzhak, senior vice president and head of Here Mobility, reckons it’s better to stay out of both. Instead, he and Here Mobility want to quietly, but effectively bring users and mobility providers together through local businesses. What the Here Mobility Marketplace aims to do is to break the monopoly on mobility services that giants like Uber possess by giving all the smaller players – who, together, are larger than Uber, but easily overlooked – equal visibility on its platform. Rather than lock the end user into a select number of services for each city, the platform is designed to be integrated with the apps and websites of local businesses to show their customers the most effective ways to get to and from their premises. Although Here Mobility does have its own application that makes use of the platform, the service is aimed in the first place at these businesses, ranging from large ones such as hotels and airlines, to smaller ones such as restaurants. As such, Here Mobility offers a web widget and a software development kit (SDK) – a piece of code that can be integrated in an existing application, which allows users to plan their journey within the business’s app or website. In addition, Here Mobility also offers a physical kiosk that can be placed in, for example, a hotel lobby. Local businesses can use the service for free, while Here Mobility takes a commission from the mobility providers. Here Mobility’s rapid growth is certainly impressive, especially when considering how slowly other MaaS initiatives are ramping up – MaaS Global’s Whim is now live in three cities with a handful of operators in each and UbiGo will launch in Stockholm in September. Meanwhile, Here Mobility Marketplace is set to go live in cities and regions all around the world over the coming year, so what is their secret? Itzhak is keen to point out that his team is world-class. Combined with the weight of an established company like Here, that certainly won’t hurt. Yet the truth is that Here Mobility is approaching the MaaS problem from different angle than others. Here Mobility doesn’t handle payments. Instead, it redirects users to the mobility provider’s system. Although public transport journeys can be planned through the service, they cannot be booked directly. It means there are no complicated subscription models to be worked out and agreements with mobility providers are much simplified. What we see, then, are three different approaches to solve MaaS. A giant like Uber tries to offer as many modes of transport as possible, covering the market by itself and pushing smaller players out, around the world. 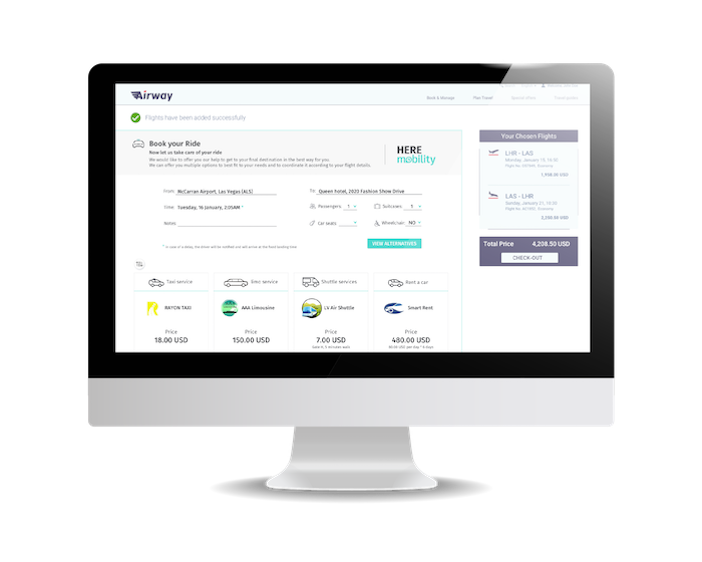 MaaS providers like Whim partner with a small selection of mobility providers in selected cities to offer a high-quality, but geographically limited service. If Itzhak’s prediction that most mobility providers won’t survive the next two years is true, then that will be too little, too late, while a monopolized market doesn’t benefit consumers. With those assumptions in mind, it makes sense that Here Mobility is pursuing a large market, with a perfect user experience to be realized later on. Time will tell which strategy is right.